Prince William County Public Schools offers Junior Reserve Officer Training Corps (JROTC) programs for the Army, Navy, Air Force, and Marines at nine high schools. Students are encouraged to enter the program in the ninth grade in order to receive the full benefits of the four-year program. Applications are available at the program locations. Students who wish to participate in JROTC shall enroll in their base school or in the program to which their school is assigned. Each year, more than 51,000 high school students from across the country enter to win a share of the $2.2 million in educational scholarships and incentives awarded through the VFW’s Voice of Democracy audio-essay competition. Visit the Veterans of Foreign Wars website for more information. Reserve Officer Training Corp and military academy scholarships may be available for qualified students. These courses are designed to teach ​citizenship and leadership skills through their respective service. *College credit available for these courses. Upon successful completion and approval, students will receive credit from the University of Colorado that may be accepted upon entrance to other universities. Q: Is there a military obligation? A: Absolutely no military obligation is required; however, upon graduation, students can gain advanced military pay grades. Q: Can students at Brentsville District, Colgan, or Patriot High School School pursue JROTC? A: Yes. Students assigned to Brentsville District High School who wish to participate in a JROTC program can apply to the Air Force JROTC program at Stonewall Jackson High School. Students whose base school is Patriot High School may apply to the JROTC program at Stonewall Jackson High School. Battlefield High School is closed to transfer students. Students assigned to Colgan High School who wish to participate in a JROTC program can apply to the Navy JROTC program at Osbourn Park High School. 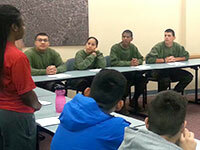 For questions related to JROTC programs, please call Career and Technical Education at 703.791.7297.